in collaboration with Lynch Creek Farm. There is also an amazing giveaway. See details at the end of this post. from Lynch Creek Farm that were placed on my front doors. I used the Port Orford Cedar Garland instead. 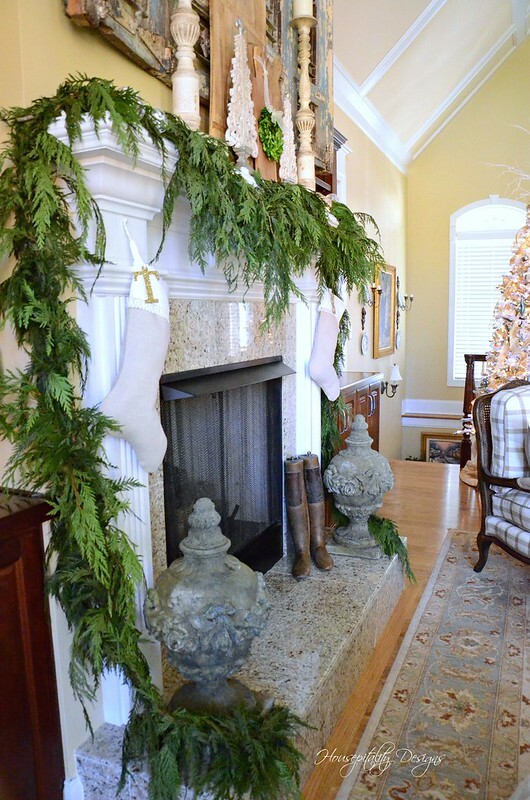 I kept the mantel decor to a more minimal look, letting the garland be the star. down the side of the fireplace and onto the hearth. I chose this garland for the beautiful cascading effect. beautiful centerpieces like this one, the Snowberry Glow. It is just as beautiful and fresh as the day it was delivered. so I placed it in a footed ironstone bowl. The snowy birds love the Snowberry Glow centerpiece too! And let’s not forget the deer! in addition to adding that wonderful scent of the Holiday season. Thanks so much for stopping by and visiting me today. I will be presenting more of the Great Room all decked for Christmas soon. what item (wreath or centerpiece) you would love to win. just by visiting my other 5 friends on the tour and leaving a comment there too! so we can contact the winners! This giveaway is limited to residents of the Continental U.S. and Canada. The deadline for this giveaway is midnight, Sunday, December 3rd. in your home by stopping by and visiting my 5 wonderful and talented friends. Remember, by leaving comments on their blog posts you have more chances to win! Our sincere thanks to Lynch Creek Farm. Note: Lynch Creek Farm sent me the garland and centerpiece for my review. All glorious reviews are happily and very joyfully my own! Love the Bah Humbug wreath!!!! Mary’s recent post…Christmas Nesting and a ‘Deck the Halls’ Giveaway! Hard to pick a favorite but I do love the Snowberry Glow also. And as for a wreath, the Mixed Holly is a beautiful traditional favorite. 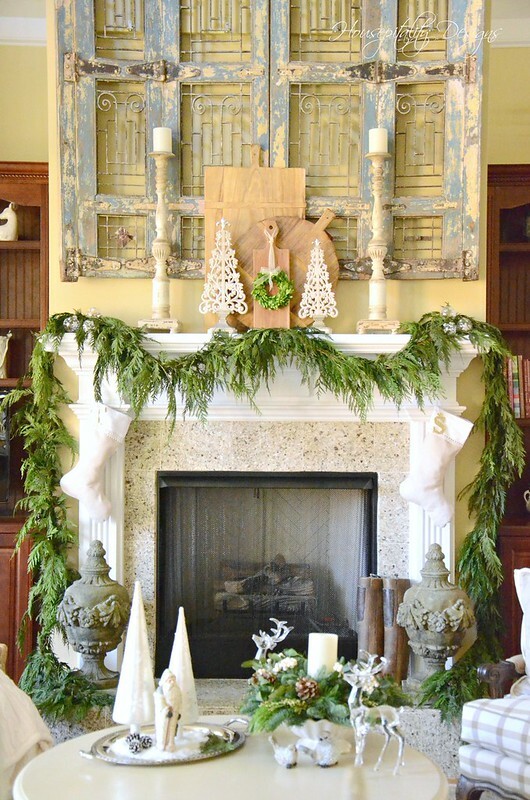 I love that fresh drapey garland and how it softens the fireplace. The added decor is perfect and not overdone. The centerpiece is so cute and I know how good all of this smells! I love the rustic elegance of your decor. My choice from Lynch Creek would be the Vintage Glow centerpiece. you are so joyful…always! love the garland and the centerpiece in your holiday home. I bet it smells devine. I love the Lynch Creek firs..and your decor is beautiful..my choices are the Wildlife Centerpiece and the Red Elegance Wreath. So pretty Shirley…I love cedar garlands and your’s looks fabulous! Shirley, your garland looks so spectacular on your beautiful mantle! 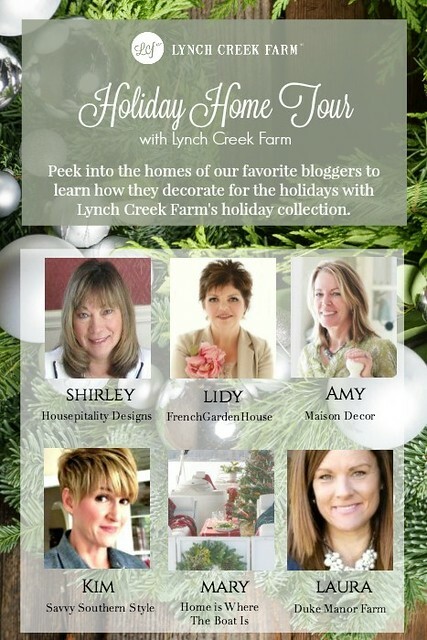 Thank you for hosting the Lynch Creek Farm blog hop, I really enjoyed it. Beautiful post. I love the Southern Magnolia Wreath. Thanks for the chance and the introduction to Lynch Creek Farm. Gorgeous! And there is nothing like the look and smell of fresh garland! I love the winter elegance wreath. I would like the Mr.Snowy Centerpiece. My kids would love seeing the little snowman. Your home is beautiful and the garland lovely on the mantle, wish I could smell it. I love the Wildlife centerpiece and Wildlife wreath. Thanks for hosting this blog hop. Merry Christmas! I love the Mixed Holly. Home for the Holidays centerpiece would be lovely. Thanks for the opportunity to win! Love the Holly Hill Basket! I love the Wildlife centerpiece. Thanks and your decorating is beautiful. The garland looks so beautiful the way it drapes! I love the Frozen Pine wreath. Finding a suitable centerpiece is always one of my biggest problems no matter what the holiday. I really fell in love with the wildlife center piece with the Cardinals. It’s perfect for me, because I have been a cardinal baseball fan all my life. Thanks for the introduction to this wonderful company. Shirley, your touches of fresh greenery garlands and centerpieces look just beautiful in your home. I’m sure it must smell amazing! I love using gifts from nature to decorate my home for the holidays. It just makes things feel more warm and inviting. I visited the site, and I love the Southern Charm Centerpiece. I hope that you have a wonderful day! It’s always that time of year when you show your holiday decor! Loving the garland you chose. I bet the smell is incredible. I’d have a hard time choosing a wreath, they are all gorgeous. SO I think for me it’d have to be either the 3 cedar or the southern magnolia. Have a great week and thanks for the chance to win something during a hectic holiday season. Thanks for your wonderful inspiration! I will be using the garland on my dining room hutch and fireplace mantel. Your mantel looks wonderful. Love the garland- it looks very pretty the way you’ve displayed it. 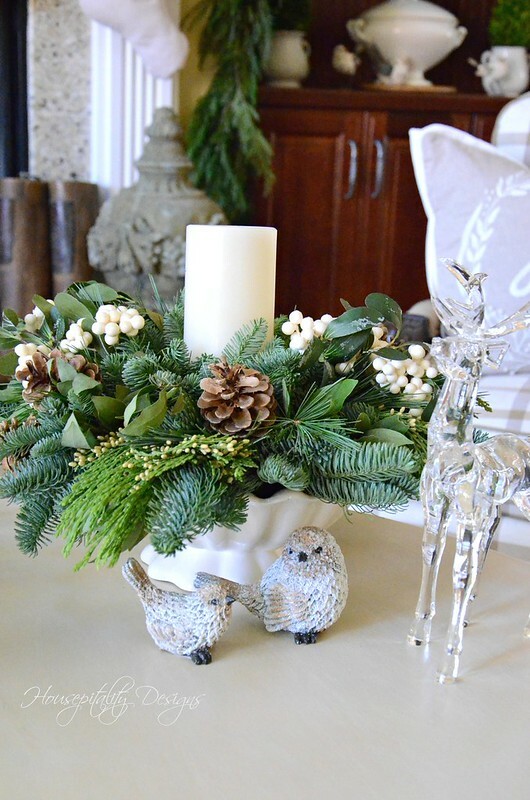 I love the Country Sleigh centerpiece arrangement from Lynch Creek Farm! Liz @ Home and Gardening With Liz’s recent post…Addicted To Growing Flowers! The birch and burlap centerpiece is calling my name….love, love it. 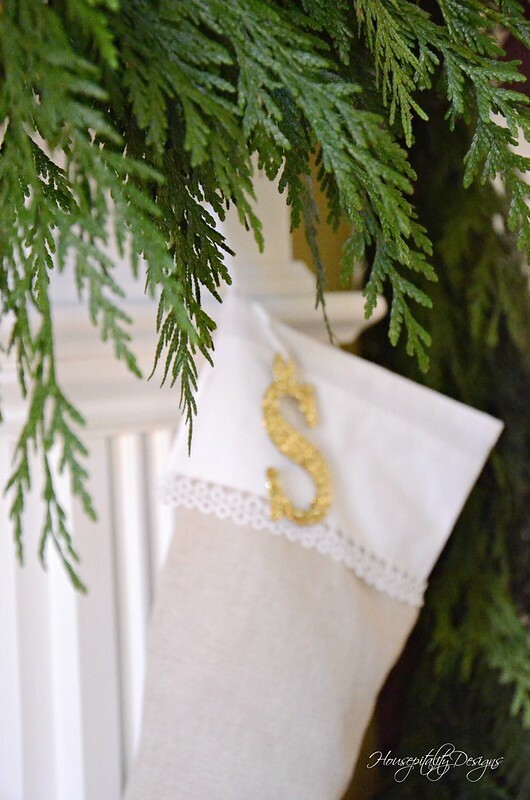 The garland is just perfect for your mantle. I love the Vintage Glow arrangement, as I look around our home there are a dozen places I could use it. Thank you for the chance to win something so beautiful. Merry Christmas!!! Oh the evergreen orb is gorgeous and I would LOVE to win it!!! Your mantle is beautiful, I love how the garland drapes so beautifully! And the wonderful scent of Christmas is the icing on the cake. I do miss that so may have to get some fresh greens to place here and there, especially for the Open House! I have always LOVED your glass deer, they are beautiful! Have a great day. Oh the Two Turtle Doves wreath for sure! Our wedding theme was love birds, so that wreath would be fantastic. The Two Turtle Doves wreath is perfect! I decorate in the 12 Days of Christmas so this is so wonderful. Thank you! What a lovely way to start the day! I choose Hunter’s Hollow. Thanks for this wonderful opportunity! I love the table top centerpiece with the rustic red lantern. I love the WILDLIFE ADVENTURE WREATH! THE COMBINATION OF FRESH GREENERY AND CARDINALS IS A WINNER. It will go beautifully with my Lenox “Holiday Greeting” dinnerware which has the different birds. Thank you for this offer and to Lynch Creek Farms!! I love the Wildlife Centerpiece! Thank you so much for offering such a lovely and generous giveaway! I would choose Two Turtle Doves. Nothing like Cedar. We light too many fires for real greens on the mantle. Love the plaid traditional wreath. Your mantel is lovely. I too love that the garland reaches all the way to the hearth and more! I would choose the Blended Bay wreath. I love herbs and love that this one has bay included. Really everything at Lynch Creek Farms is beautiful. If I had to pick I would love to have the Snowberry Glow centerpiece. I bet it smells terrific! I would choose the Red Elegance wreath. Your decorations are beautiful, warm and inviting. Beautiful photos of your lovely home! Thanks for sharing, I just love your blog!!! Where did you get the, what looks like, cast iron Christmas trees on your mantel? I adore the Southern Charm centerpiece! 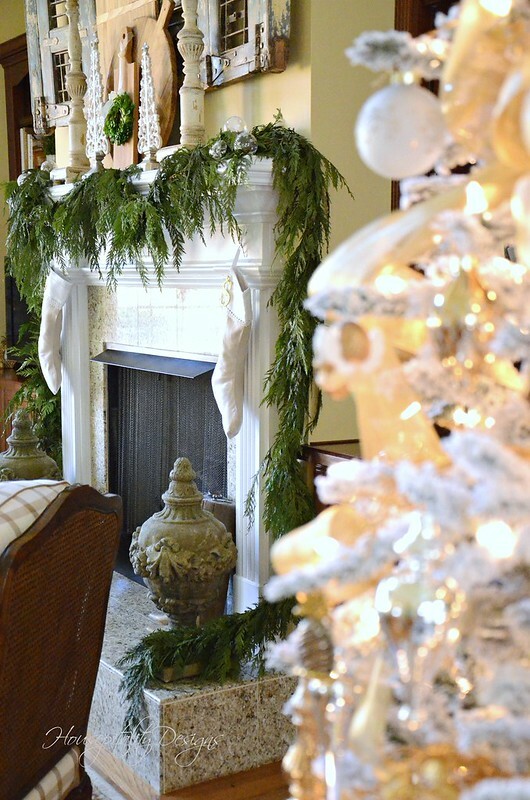 Your mantel and decorations look simple, but, oh so elegant! 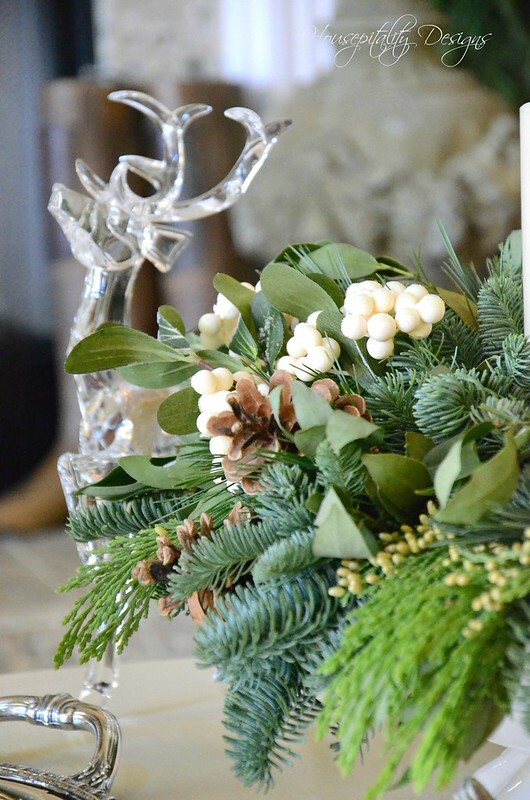 And, looking over the Lynch Creek Farms website, I have to admit you picked the most elegant Snowberry Glow centerpiece. I would love to see it on my dining room table. Thank you, Shirley for your decorating inspiration! 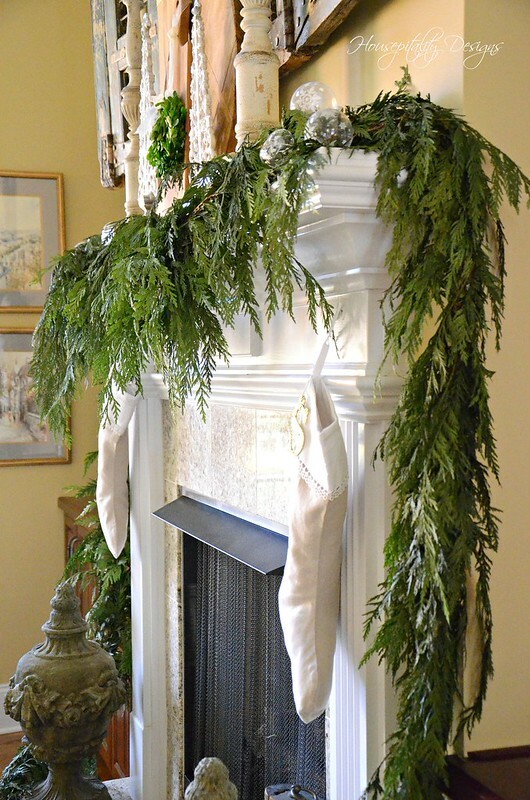 Love your mantel with the cascading evergreen. I bet it does smell like Christmas in your house. I love the Sandals and Seashell wreath. A fun twist on tradition. Thank you and Lynch Creek Farms. Thank you for the opportunity to win a Centerpiece . My favorite is the wildlife Center piece . 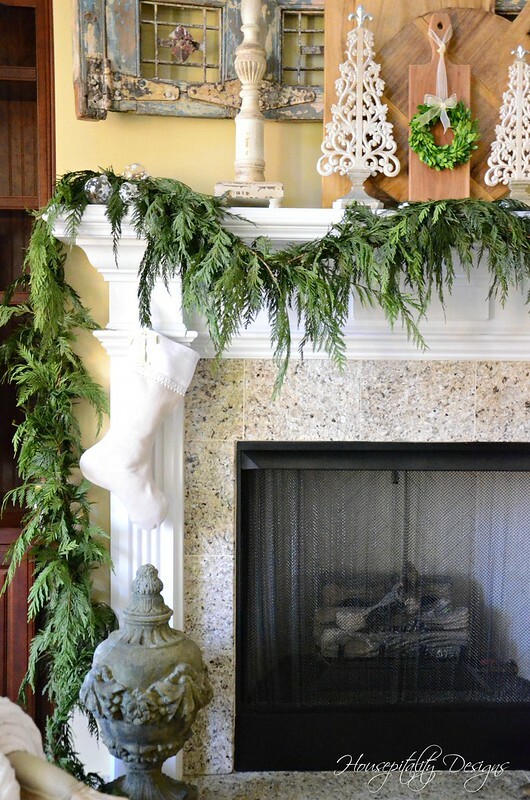 Your mantel is beautiful with fresh cedar garland. This has given me inspiration to try something similar for my fireplace. I would be thrilled with the Wildlife Centerpiece. I use cardinals everywhere at Christmas! Thanks for the opportunity! There’s nothing like live greens in the home for the holidays. I always try to bring in a little bit of live greenery, even if it’s just a few branches tucked in amongst my other decor. I liked all the live products, but the Tartan Centerpiece was one of my favorites. I would love the Plaid Bow Traditional wreath. I know it smells wonderful in your home. Thanks for the chance to win. Lovely! Love majestic Magnolia wreath and Southern Charm centerpiece! I’d love the Hunter’s Hollow centerpiece. I love the Hunter’s Hollow or the Wildlife centerpieces. Love the birds! Love the Gift Wrapped wreath. They are all lovely! I really liked the Frosty Christmas centerpiece. 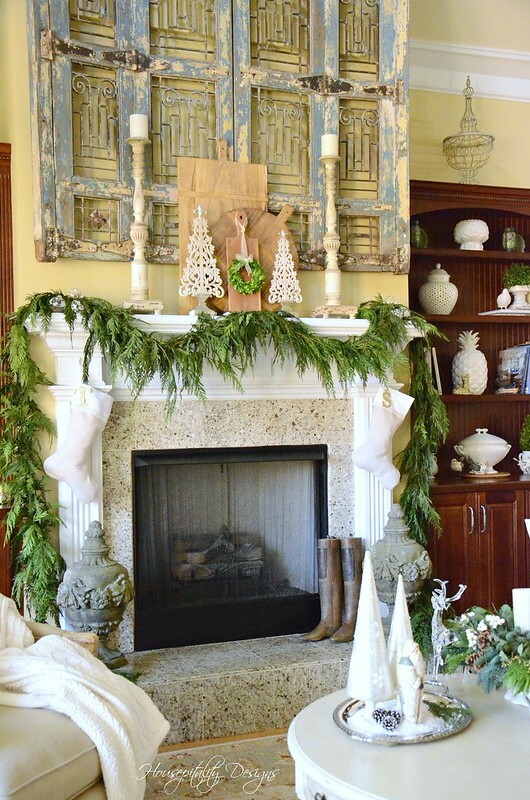 Shirley, I love your fresh garland draped and cascading on your mantel! I know it must smell fabulous!. I really like that you allowed the garland to be the star! The wreath enclosing the candle is stunning! I can’t wait to see your beautiful home all decked out in Christmas finery! 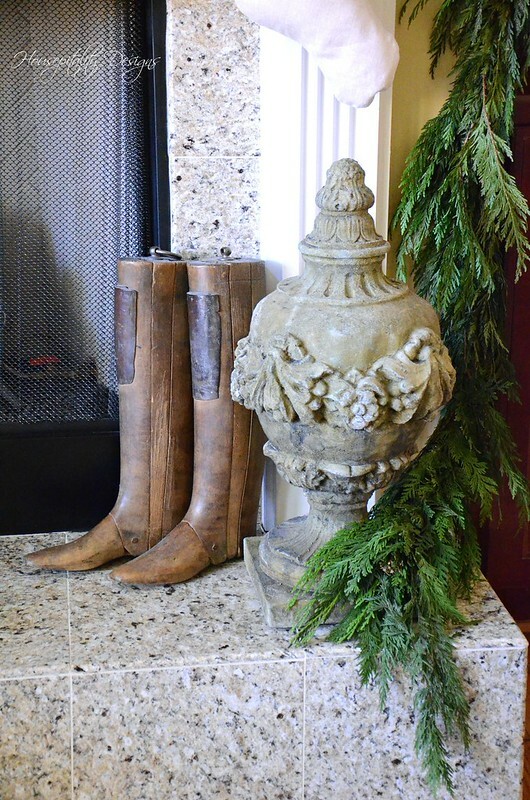 Your mantel is just beautiful…I like the Hunter’s Hollow centerpiece. I absolutely love the Majestic Magnolia Wreath. It’s so lovely. Your home looks beautiful,simply elegant! So hard to chose one item when would love all! I would be so happy with any of the breathAble for this opportunity. Shirley: The cedar garland is stunning and is beautifully arranged. It very much resembles Leyland Cypress, another gorgeous greenery. 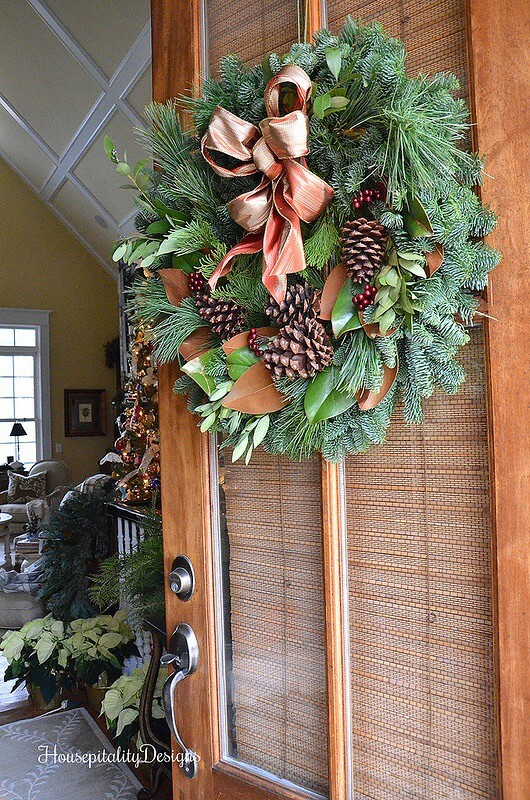 Also, love the wreath on the door with the touch of magnolia leaves – so very pretty. Looking forward to more of your beautiful work as we go through this wonderful season. Your home looks so lovely in its Christmas finery! I would definitely choose the Two Turtle Doves Wreath. It would be perfect for our little Craftsman style nest where there are just the two of us! Love them all, but if I had to chose, I’d pick the Snow Berry Glow centerpiece. Love your Christmas blog. Everything is so crisp, clean, and timeless! An inspiration! I ALMOST went with a Port Oxford cedar garland, too, but then realized I wouldn’t be here to take care of it and….well, you know how that goes! The smell is just unbeatable, and the way it drapes is just heavenly!!! I love the bread board arrangement on the mantel! How cool is that??!!??!? You just have beautiful little touches all around the room that make it feel absolutely warm, wonderful, inviting and brimming with cheer!!!!! Your living room is beautiful! So much to love but I think I would choose the Tis The Season wreath or the Golden Magnolia centerpiece. I like the wildlife centerpiece. Your mantle looks great! Thanks for sharing. The Bronze Magnolia is Stunning!! Thank-You so much for the chance!! How pretty Shirley! Nothing beats the real thing…that’s for sure. I too love the cascading effect. 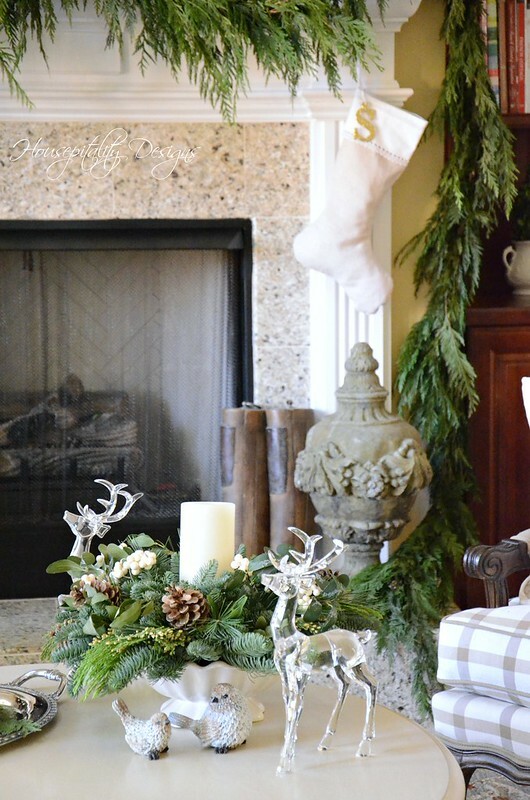 Your mantel looks gorgeous and I love the little table centerpiece too! Merry Christmas, Shirley! I agree–the way your garland drapes and cascades is perfection – not much else needed. I love the Bronze Brilliance centerpiece (perhaps the same ribbon from your wreath last year?) Email is dietruapattillo@gmail.com. Thanks! Oh Shirley, their wreaths and centerpieces are to die for. They’re all so beautiful, it’s hard to choose just one. I love sleighs, so I choose “Country Sleigh” centerpiece. Thanks for having this contest. Hope I win. The garland and centerpiece look perfect in your room. I would choose the Tartan Centerpiece for my home. Everything is so beautiful but my favorite wreath is the Blended Bay. My email is tamra3896@yahoo.com. The garland is a show stopper Shirley, it looks so real! Your home looks gorgeous! Jenna’s recent post…Holidays, Kick off the Holidays with easy recipes and crafts! Everything is beautiful! I like the Country Sleigh centerpiece. I love the majestic magnolia. Magnolia leaves are not in abundance in Penna. Thanks for a chance to win. Love the Mountain Vineyard Basket! it would look lovely on my Dining Room Table! 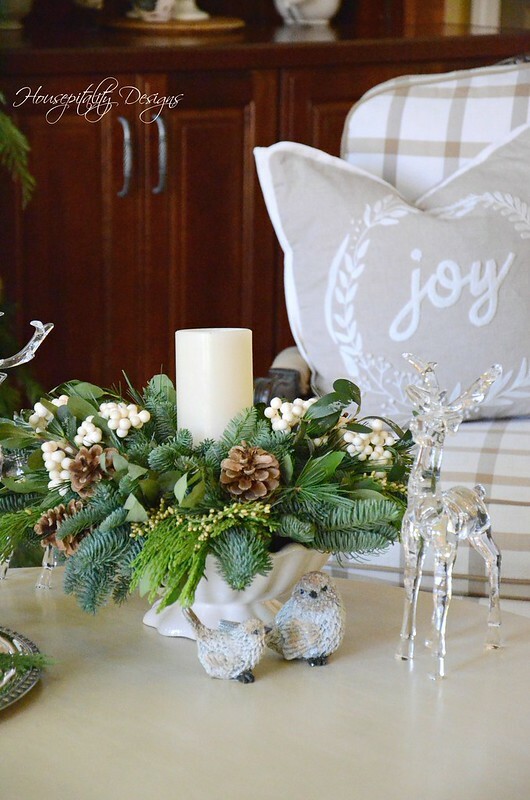 Frosty Christmas is my favorite centerpiece from Lynch Creek Farms. I hope I win! I would love to win the Tis the Season wreath! Just LOVE “Platinum Blue with Lights” centerpiece! I’m changing our Christmas theme to this blue & silver this year & it would look great on our dining room table! Love the Country Christmas wreath. I love the Blended Bay! Thanks for the opportunity. I really like the Plaid Bow Traditional wreath. Your mantel décor is lovely! Shirley your home is always stunningly beautiful! You just have the knack of making everything look lovely. That’s a talent. My favorite centerpiece is the birch and burlap. But they’re all beautiful. My family would enjoy a Frosty Christmas centerpiece, since we are born and bred in sunny Florida. Thank you for hosting and spreading the news of Lynn Creek Farms. Beautiful! I like the Western Lantern Wreath. Your mantel is beautiful! 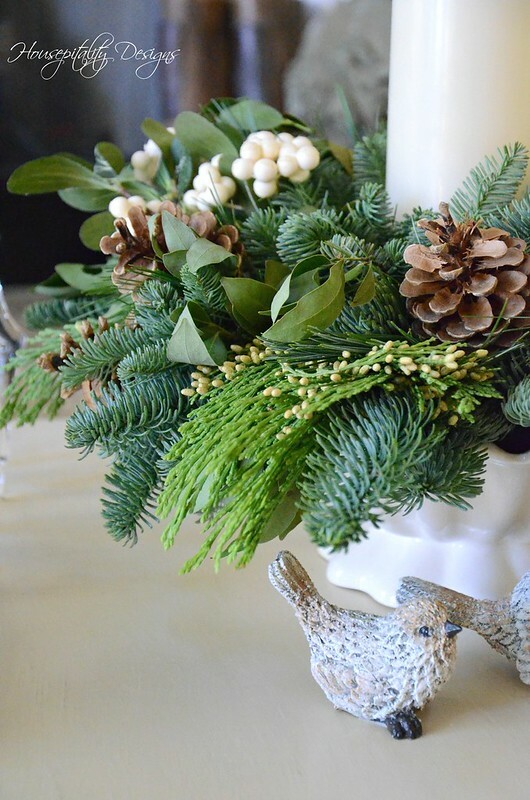 Port Ordford Cedar is one of my favorite Christmas greens–it smells so wonderful and has a beautiful drape. I would love to win the “tis the season” wreath! It is a tough choice as everything is so lush and beautiful. Love your mantel with the cutting board display! Very creative! I would love to win the Leaping Deer wreath! Thanks for this opp! I love the Winter Frost wreath most! Thank you for sharing your beautiful room. I would love Hunters Hollows centerpiece. All are so beautiful. Thanks for the opportunity! I love the wreaths! The plaid bow traditional is my favorite and I’d be thrilled to win it! Everything is gorgeous! 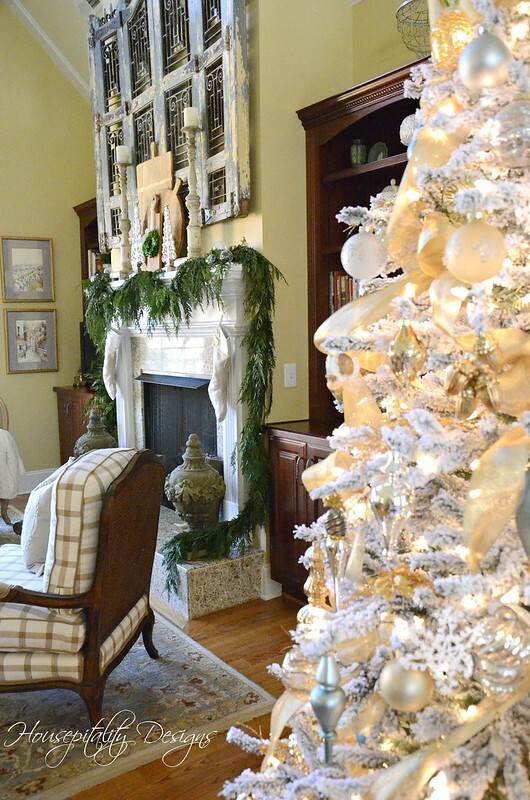 I love the bronze magnolia wreath at Lynch Farms…The garland looks exquisite on your mantel. Hi Shirley, your garland is beautiful!!! I love the simplicity! I would love the Wildlife Adventure wreath as I am decorating one of my mantles with cardinals! I loved the mixed green garland. Their prices are really good for the look and quality. Thanks for the chance to win. Your home us beautiful, I don’t know how you will leave it.Did you post what your future plans are? Gorgeous…and I’m with you, I love the Cedar Garland. It’s a classic. I would love the Bronze Magnolia wreath or the Snowberry Glow centerpiece. Having the live scents of Christmas in my home would be such a treat for my family. I would choose the Majestic Magnolia wreath. All so beautiful! What’s there left to say…. Your home is just exquisite!!! Our grand son came in the other day and stated that our home is very Festive….He’s 21.. But wouldn’t it have been amazing if he said that it smells amazing with the fresh greenery. The wreath or centrepiece would just make my day. Then he would comment wow Nana your home smells just like CHRISTMASS!!! 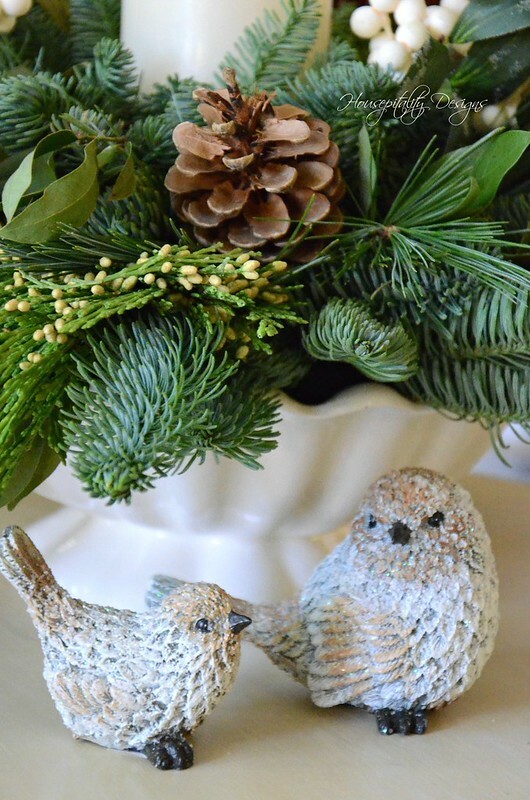 Such beautiful wreaths & centerpieces, I Love the Wildlife centerpiece as I decorate with cardinals! Such a hard choice! I especially love the Majestic Magnolia wreath. Thank you for the fabulous giveaway! Lynch Creek Farms for the opportunity! Hunters Hollow is my favorite centerpiece. Everything is beautiful and I know I can smell the evergreens thru the screen. I love the Winter Radiance wreath it’s beautiful. I am getting my new puppy on December 7th so I have a feeling all of my decorations will be up high this year. I love the plaid bow traditional wreath. Your mantle and living room are lovely! Thanks so much for sharing. I can’t tell you how cute the Birch and Burlap centerpiece would look in my kitchen! Thanks so much for hosting a giveaway! I love your fireplace. Love the texture in the piece that hangs above the fireplace and adding simple other wood tones with the cutting boards and placing your candles higher. All with the simplicity of the green garland gives it a nice touch for holiday. Visiting Lynch Creek Farms was a fun thing to do with a cup of morning coffee. My favorite wreath is the Holly Ever After with the two Red Cardinals sitting together. Simple and Sweet! The Wildlife Adventure is my favorite! Gorgeous products at Lynch Farms. I would choose the Burgundy Elegance wreath. I enjoy your blog. I just went through a huge remodel and don’t have much $ for Christmas Decorations this year. I absolutely love natural decorations and would love the Winter Frost wreath because I want to incorporate red into my Christmas decorating this year. I also love the way you decorated with neutrals….may go neutral in another part of my house ….Thank you for sharing your beautiful home and ideas with us. Merry Christmas! Enjoyed your tour. I would pick the Magnificent Magnolia Wreath. beaustiful! 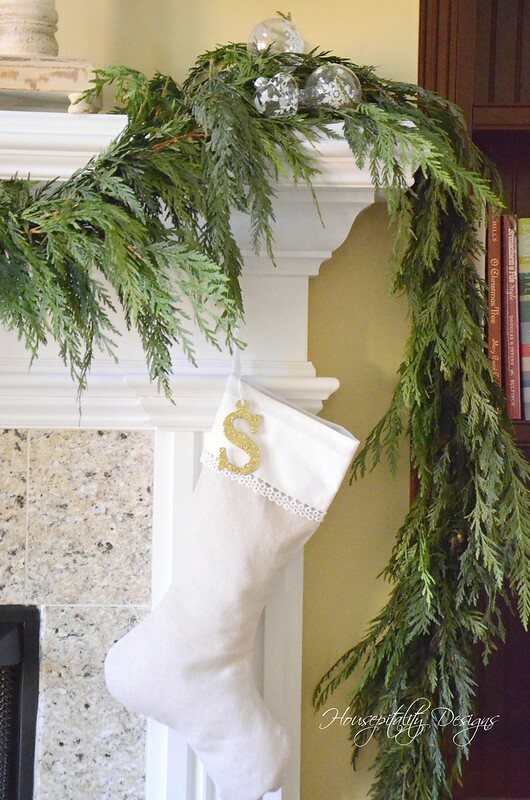 I Love how you used the garland on the Mantle. It inspires me to use garland on my Mantle with the Neapolitan Nativity figures purchased during our tour of duty in Naples Italy years ago. Bronze Magnolia and Magnificent Magnolia because they remind me of the decorations of my youth. Beautiful! I can almost smell the evergreen. The greenery and white throughout is clean and fresh looking I’m in love with everything I’ve seen at Lynch Creek Wreaths, etc. but I’m particularly drawn to the 4 Evergreen Heart wreath. I can just picture it on my front door greeting us and friends each day. I love all of your beautiful decorations in your home. Thank you for sharing it with us. All of the wreaths are beautiful at Lynch Creek, but I am most fond of the Country Christmas wreath. I’d enjoy the Mountain Vineyard Centerpiece. It appears that you have your decorating done so come on over and help me out. During the holiday season do you have your house on the market? Did I see somewhere that you organized the home tour? It’s fun seeing how different ones decorate. Everything is just lovely, but my favorite is the Snow Berry Glow, perfect for the holiday and the new year. You just have such a special touch in everything you do Shirley. I love all of Lynch Creek’s beautiful wreaths and arrangements. The varing greens in your Snowberry Glow arrangement are so lovely. Putting it in the ironstone bowl really adds that special touch. I am eweing & ahhing over the way the garland just drips over your fireplace. Btw, I love your glass deers They are so pretty. Thank you for the chance to win something special just in time for Christmas. They have so many beautiful items to choose from. I’d love to get the Pacific Bay Centerpiece in red or perhaps the Wildlife Adventure Wreath. Love your decorating, so very beautiful. I also, love the Hunters Hollow Centerpiece. Thanks for the tour. Love love love your last picture..very rustic..
I’m gifting is I’m lucky to win..and I’d be hard pressed to pick a favorite if it was my choice. I do like lime light, your pick because of the birch wrapped vessel..out of stock silver white wreath..and the charming bronze lantern wreath…reminds me of grandmas on the farm as a sweet token of my childhood.. So glad I saw this Giveaway and “found” your blog! 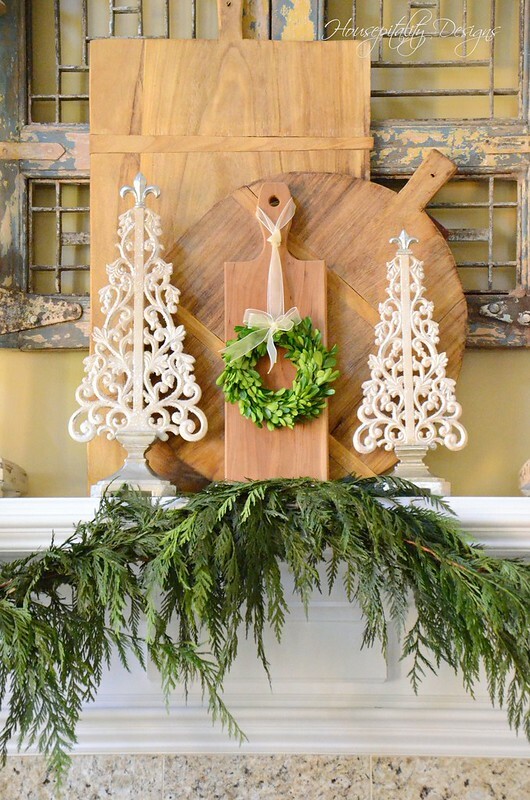 I loved the sweet simplicity of the little Boxwood wreath you hung from your cutting board! My favorite centerpiece from Lynch Creek Farm is Bronze Brilliance! 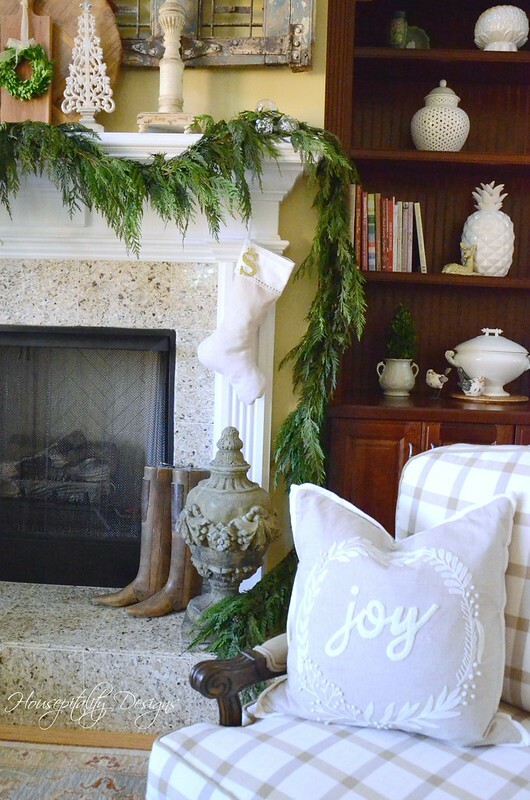 That cedar garland is gorgeous, I would definitely love that to warm up my farmhouse decor, or the mixed cedar wreath . 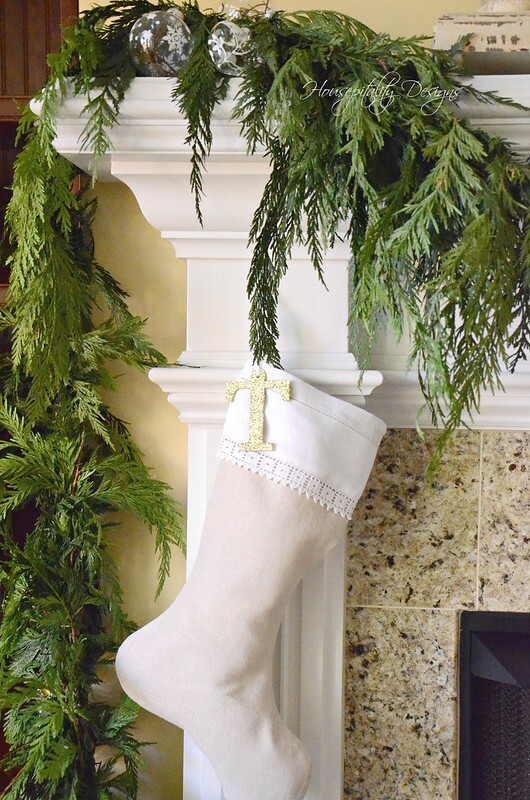 Also those stockings are very pretty.. that is a beautiful room. It’s really hard to decide, but I narrowed it down to the Southern Charm Centerpiece. They are ALL so beautiful, it’s hard to decide! A person could spend a loooooooooog time on that website! However, as soon as I saw the Christmas by the Bay – with Chimney centerpiece I knew what I would wish for. Thanks to you and Lynch Creek Farm for the giveaway. I’d love the Country Christmas Wreath!